They say that when one door closes, another one opens and that saying cannot be truer than for Shannon Smuts. When she found herself first out of the Master Chef house after 5 days and still with 7 weeks of her sabbatical left, she started volunteering at the Fountain of Hope farm in Philippi. This farm provides the Baphumelele Children’s Home with fresh produce and is part of the youth program associated with young adults who have been under the care of the home, and are now 18 and no longer wards of the state. On her return to her media job, the space at 21 St. Johns Street became available and Shannon decided to follow her dream and opened Pure Good. To support the farm, Shannon purchases as much as they can offer her. She has had instances of receiving boxes of parsley from the farm which was turned into soup. 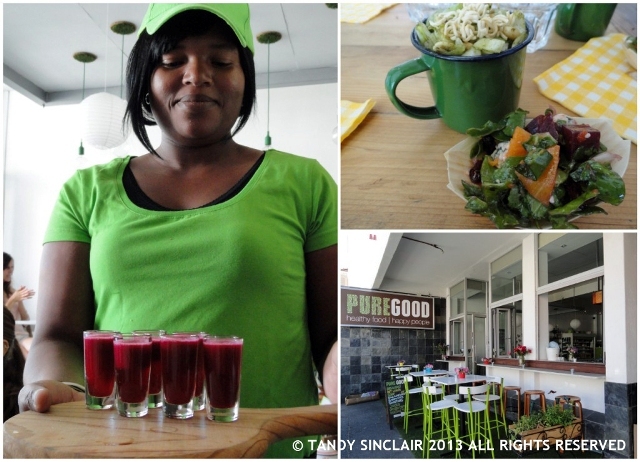 At the moment the farm has an abundance of spinach and beetroot and so the ingredients feature on her menu. Shannon is open for breakfast and lunch Monday to Saturday and I was invited along with a few other guests to sample her summer menu. Luckily for me parking was not an issue, but I can well imagine that during the week it is. 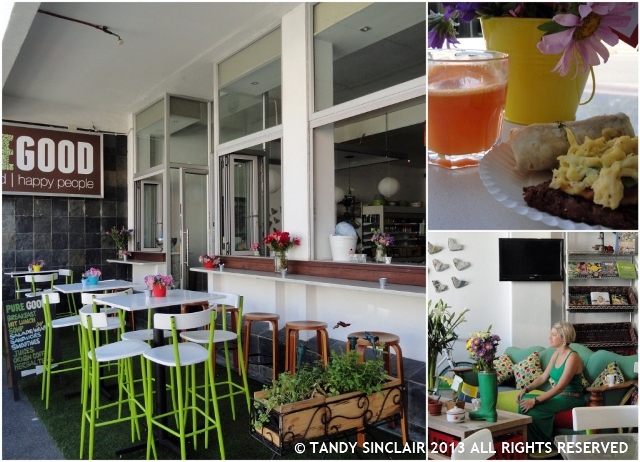 I would suggest finding parking in Roeland Street and walking down to Pure Good. Our tasting started with an orange blossom juice which is made from peaches, oranges and carrot. The orange was so distinct in the juice. We also had a breakfast stack which has my new favourite combination of eggs and avocado, and a breakfast wrap. The bread on offer is gluten free and home made, and other than the caramelized onions everything is sugar free. Shannon starts all her meals as vegetarian and adds the protein to the base for those who are meat eaters. Shannon also believes in using all of the plant and juicing is perfect for this. The staff (which she took over from the previous coffee shop) are encouraged to experiment with juice combinations. Our next juice was a purple haze – strawberry, beetroot, apple and mint. 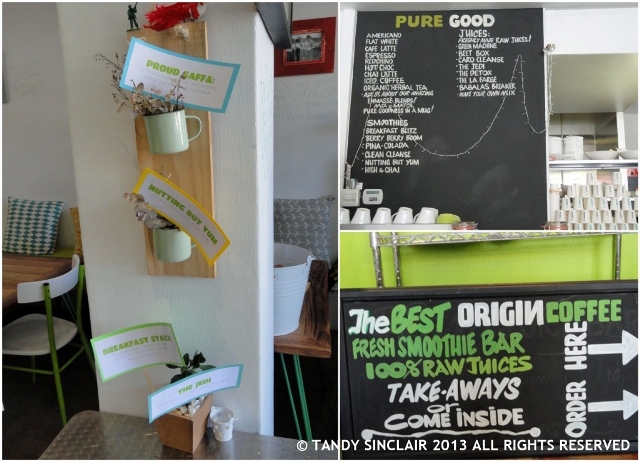 Pure Good has been open for 3 months and the venue is light and airy and very green. I love that the space is a reflection of Shannon and who she is – the photographs on the wall are of her family and a burnt green tea towel is framed. The average price for meals is R24 and you can accompany your meal with fresh juice, smoothies, a great selection of teas or a fantastic cup of coffee. 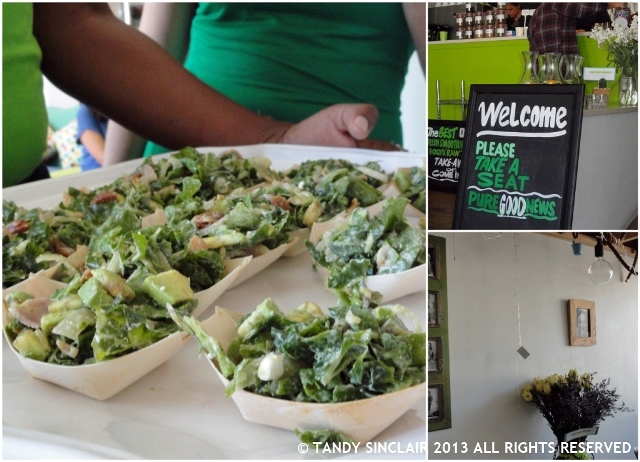 Disclosure: I was invited to the summer menu launch. I was not required to write a blog post about my experience. This post is in line with my blogging policy. Hopefully someday you can get to meet Shannon! What a lovely sounding place, Tammy. I would eat & drink there instantly with you to catch up. very nourishing – for the soul as well as the tummy! Sounds like a fabulous place Tandy. Maybe we can do lunch there? Good on her for trying to help others, and producing such a high quality product and venue in the process!